My boys share a small bathroom. Since space is at a premium, and they are now getting old enough to take care of more things themselves, I thought it was a great time to organize their bathroom and make it more kid-friendly. 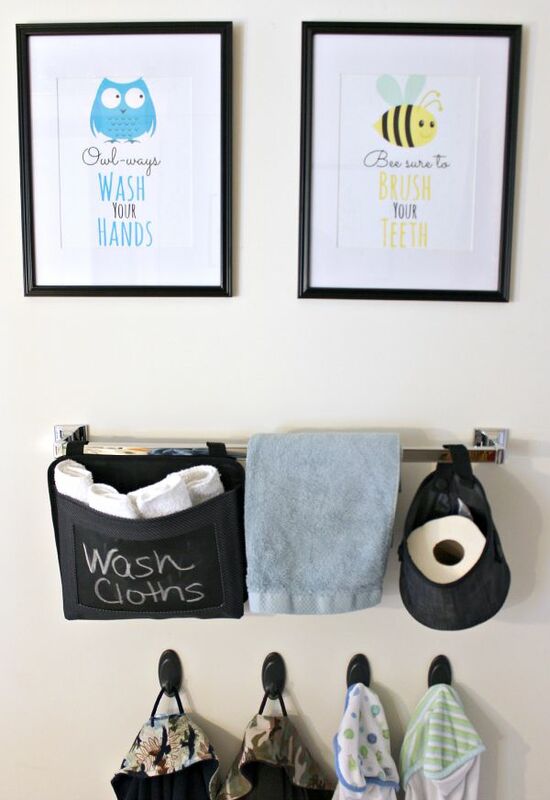 I decided to go vertical and take advantage of some great wall space, and made some really cute free printable bathroom art to help them remember what they need to do! My boys are 3, and at the age where they are gaining more and more independence every day. I wanted to organize their bathroom in a way that helps them to do more things for themselves by making the things they need accessible. Their bathroom has a good sized wall with a towel bar, but it doesn't hold much and was too high for most of their things. I didn't want to take it down and end up with holes in the wall, so I incorporated it into our organization and added a few touches to make things perfect. They are set to print at 8x10 - I framed them in 11x14 frames matted to 8x10. You can download the Free Printable "Owl-ways Wash Your Hands" and "Bee Sure to Brush Your Teeth" by clicking on the button below. Next, I decided to repurpose our towel bar. 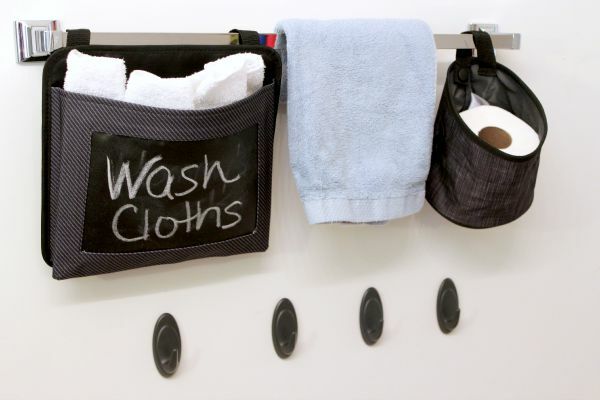 It wasn't working for me for towels, so I added two hanging bins instead. This round hanging bin was the perfect size to fit an extra roll of Quilted Northern Ultra Soft & Strong® - a necessity when you are potty training twins! Underneath the towel bar, I added 4 adhesive hooks for robes and towels. These are perfect because the boys can actually reach their own things (and hang them back up). Plus I can easily move them as my kids grow. I hung the photos on top, put the boys' robes and towels on the hooks, and we had the perfect space for everything they need! 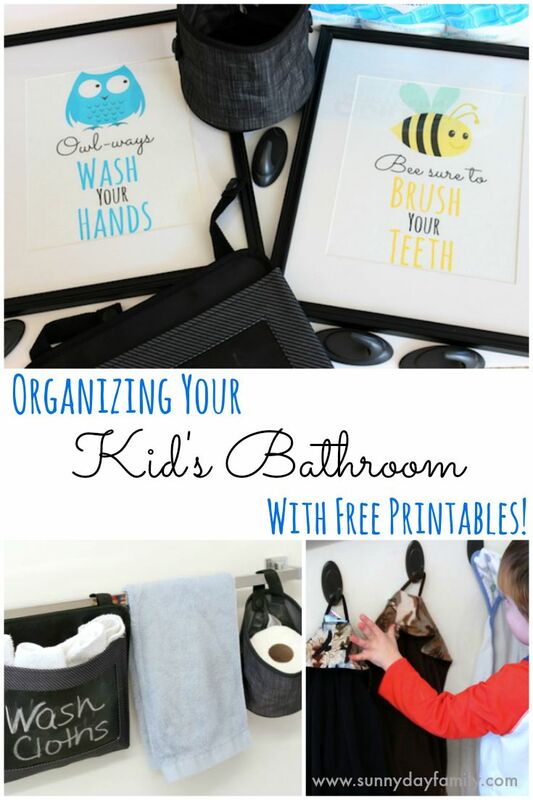 Do you have any tips or tricks for storing kids' essentials in the bathroom? Leave a comment below and let me know! I love the adorable signs! That's a much easier way than to keep repeating "go back and wash your hands!" like I'm doing all the time now, lol! These are such cute prints! I love the little animals!